It is basically a substance of pigments or colours which is encapsulated by heating it up into a carrier rasin and after cooling it up, it is cut into granular shape. 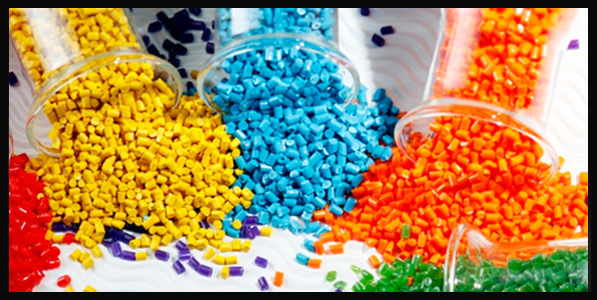 During the plastics manufacturing process the raw polymers get colored by these masterbatches. Plastic masterbatch is the ingredients which improve the quality of plastic products. There are various ingredients available in market and each and every product has some unique properties. Masterbatch has a great role to increase the quality of plastics. Masterbatch prevent UV rays to cause the degradation of plastic and it also decrease the resin comsumption and weight. Plastic Masterbatch prevents Ultra-Violet rays and it is basically UV rays protector. UV rays often caused for degradation and discoloration of polymers when it is exposed in sunrays. UV masterbatch protects the plastics from getting discolored. The elongation is stabilized and mechanical strength is increased. It mainly keeps away from crazing and chalking. The processing is improved by using it. It is basically compiled of amine-light stabilizer. UV masterbatch and so on. Plastic masterbatches are used in several places. For, LDPE/LLDPE/PP lamination, agricultural green house film, PP made products, garbage cans, outdoor stuffs, furniture that used in garden, drums, tanks, pipes, automobile ingredients, woven sacks,, chair molding and so on. Optical brightener masterbatch mainly used to increase the whitish part of plastics and it brightens the plastic without imparting any bluer pigments. It mainly consists of bis-benzoxazole type organic and poly-olefin polymer. All it can do is emitting the blue tone and reduces yellowing of polymers. Mainly in fibers, sheets and films, filaments, thermoplastics and extruded products it get used. Antioxidant masterbatch is another type of masterbatch whose basic task is to prevent the degradation of plastics in high temperature. It is formulated from phenolic antioxidants. It also maintains better stabilization and mechanical properties along with making glossy. Pipes, films, tapes, cables, injection molded parts, Geo-textiles are the fields where it is used. This type of material is formulated from the composition of Silica and amide additives. Main feature of this masterbatch is to enhance the oily ingredients of PP and PE products. Often plastics get stick together and it actually reduces the friction allowing smoothness. Steam beads bags, PE/PP/PO blown film products, tapes, cables Geo-textile are the fields in which this is used. Polymer Processing Aid Masterbatch is greatly used for increasing the extrusion ability of the products in India plastic industry. This is formulated from Fluoro polymer additives and widely used in blow molded items enhancing gloss and smoothness. The processing of poly-olefins are also get improved by it. In LLDPE and HDPE products, blown molded items, injection moulding machine this master batch is used.